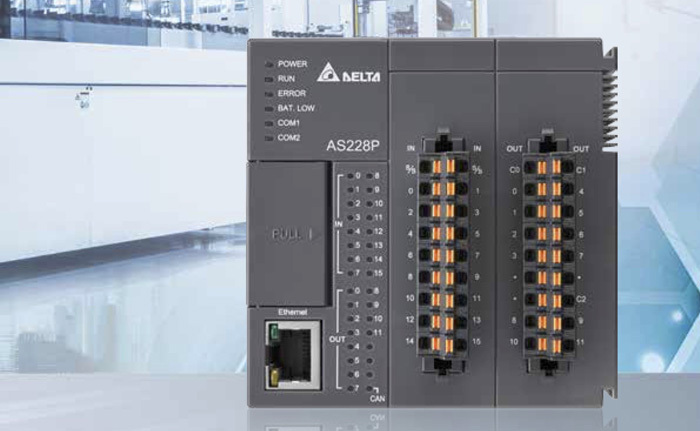 The AS200 modular PLC by Delta (Taiwan) controls up to eight CANopen drives and provides a link to Ethernet/IP. It was presented at Hannover Messe 2019. The PLC AS200 features Delta's self-developed 32-bit system-on-chip for enhanced execution speed (40 000 steps per millisecond). It provides accurate positioning control for up to eight CANopen drives. It is used in diverse automated equipment such as electronics manufacturing, labeling, food packaging, and textile machines. The Ethernet-IP interface enables connections to factory backbone networks. The compact PLC has a programming capacity for 64 000 steps. Besides the CANopen motion control sub-system, there are also local digital and analog I/O units as well as temperature and load-cell modules available. This PLC combines the benefits of Ethernet/IP backbone solutions and the motion-control capability of CANopen networks.